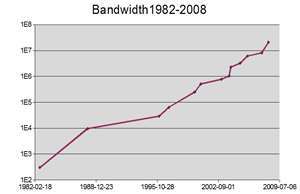 As we started the fall 2011 semester we new that we would have to add additional bandwidth. We added a new 600 bed residence hall. This added over 1,000 network drops to and dozens of wireless access point to the campus data infrastructure. At the same time we opened a new Business School, again with over 1,000 drops and dozens of new wireless access points (APs). With all of the other renovation projects going on on campus we have increased wireless APs from 300 to almost 700. We used a packetshaper to carve out 200MB for students and about 60MB for faculty and staff. I naively that that bumping residence capacity by 10% would be enough. Wrong. The first report I got one week into the semester was that we needed more on the student side. We bumped the capacity another 80MB to 300MB. This barely got our heads above the flat lined usage graphs. Days later it was faculty/staff. Their usage was also pegged. I added another 10MB and it was pegged again -- immediately. I feel like I am in a Titanic stateroom struggling to find air in a one inch of air space near the ceiling. The water is rising. Students own multiple devices. Laptops, desktops, Smart phones, eReaders, tablets and gaming devices are the norm. The content has moved dramatically to streaming audio, video and animation. Hulu, Netflix, and YouTube everywhere and 27x7. All bandwidth hogs. Students never turn off their devices. All of the devices noted above are on all of the time. They are either actively pulling down content or at least pinging wireless APs continuously. This is all great stuff, but I expect our Internet costs to jump about 25% this year. I am guessing that our use will continue to go up at 10-15% annually. As more Smart phones come to campus and more cloud apps become available for teaching, the bandwidth use will continue to rise. From my perspective as an IT professional, this is all a blessing and a curse. A recent article in the eCampus news illustrates that this rapid increase in bandwidth consumption happening on all campuses. Another short article which cites the research done by Educause can be seen at eSchool News. Colleges have a real challenge. We have students with the equipment and expectation for unlimited bandwidth. The killer audio and video apps are driving usage, and our own web based learning management systems are pumping out needed academic content at an increasing rate. Bandwidth management is a key challenge for IT leaders. We need to share ideas and hopefully technical solutions will surface.